Ten years after an unspecified catastrophic event, referred to only as “the collapse,” a man, Eric, living in a rural Australian wasteland has his car stolen by a trio of men, seemingly on the run, who have just rolled their truck. Eric sets off in pursuit of his car and along the way he encounters Rey, the younger brother of one of the trio of thieves, who has been left for dead with a gunshot wound. To Eric, Rey is the means to find his car. To Rey, Eric is the means to being reunited with his brother. After tending to Rey’s wound, they form an uneasy alliance, with neither knowing what the other plans to do when they reach their destination. The Rover paints a bleak, nihilist picture. Argentinian director of photography Natasha Braier brings an outsider’s eye to South Australia’s Flinders Ranges, giving a stark, menacing quality to this barren landscape, this vast emptiness. The film seems to have come from an angry place within Michôd. The temptation is to refer to it as a post-apocalyptic film, but to do so would not quite be accurate. “The collapse” which precedes the events of the film is not as the result of an external force. The implosion of society appears to have been its own doing. The fact that traders in the film refuse to accept anything other than US dollars suggests that there is an economic element to this collapse. The world that remains is a harsh one in which survival is the only priority. 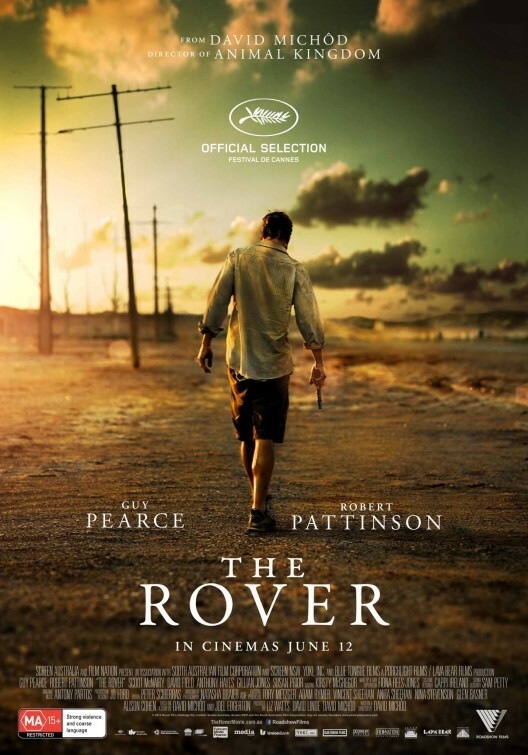 At the heart of The Rover are gripping lead performances from Guy Pearce and Robert Pattinson. Pearce’s Eric is an unstoppable force. A man stripped of any remaining personality or morality, his pursuit of his car is single-minded and relentless and it is not until the very final moment of the film that we are given any insight into his motivation. Pearce and Michôd perform a delicate balancing act with Eric being at the same time the film’s protagonist and its most terrifying character. His ruthlessness and seeming disregard for human life is important though, because it serves to humanise Pattinson’s character, and draw us to him. Where we understand Eric as the type of man who can survive and even thrive in this bleak dystopia, the developmentally challenged Rey lacks that hardness. In what is undoubtedly the performance of Pattinson’s career thus far, he gives his character an underlying innocence and vulnerability despite his determination to appear threatening. The Rover is a confrontingly violent film. This is not a reflection on the quantity of violence, but rather the coldness with which Michôd presents it. This world evidences a complete disregard for the sanctity of life. The first killing is quite shocking, because at that point we have not been prepared for the cutthroat way in which this society operates, but from there on it is a challenging, merciless film. There have been numerous films in this dystopian wasteland genre, but none quite as nihilistic as this one. An unsettling but engrossing picture, in Michôd’s mind The Rover is a more hopeful film than Animal Kingdom. I would be surprised if audiences agree with him. Have you seen The Rover? Leave a comment and let us know what you thought. Writer/director Neill Blomkamp made the world sit up and take notice in 2009 with District 9, a powerful allegory for apartheid era South Africa and one of the most original science fiction films in recent memory. The success of that film – it took $210 million worldwide off a $30 million budget – has afforded him a larger canvas for his second film, Elysium. The year is 2154 and Earth is in ruins. Those who can afford it have moved off-planet, taking residence on a man-made habitat in Earth’s orbit called Elysium, where they protect their standard of living by using what’s left of Earth’s resources and protecting their borders from undesirables. On Earth we meet Max, a career criminal trying to live straight. A work accident sees him exposed to a severe dose of radiation, the result of which is he only has five days left to live. His only chance at making it is to get to Elysium. 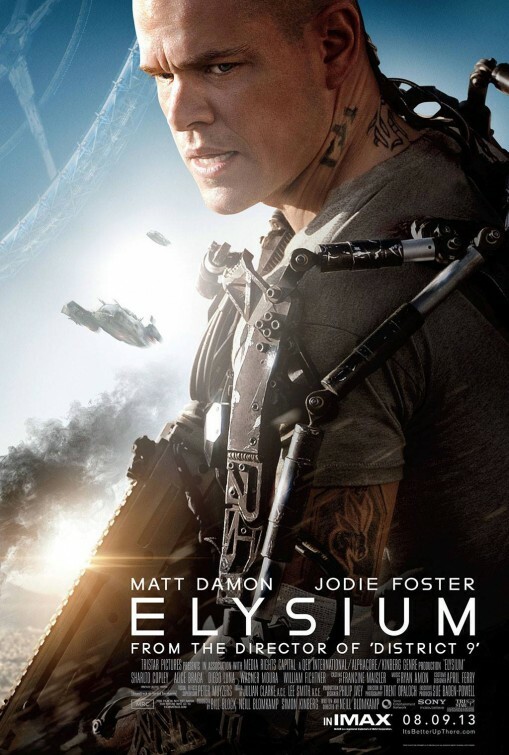 Despite being a genuine Hollywood movie this time around (the budget is estimated at $115 million) with an A-list cast, Elysium maintains a similar feel to District 9. Again, Blomkamp is engaging in socially conscious science fiction. While Elysium is not as specific and allegorical in its focus as District 9, the film seeks to engage with a number of prominent social issues including the gap between the haves and have-nots, illegal immigration and the seeking of asylum, and the necessity of universal healthcare. It is difficult to imagine that a more overtly socialist Hollywood blockbuster has ever been made. The film looks amazing. While Blomkamp mainly gets praised for his narrative and broader aesthetic, he is an adept user of CGI. Naturally, as a big-budget sci-fi blockbuster, Elysium contains its share of spectacle, but it is the subtle, unobtrusive way that the film employs CGI which is most impressive. One of the most effective uses of CGI is in the simple way that in the scenes on Earth we can see the distant figure of Elysium hanging in the sky. It has a strange beauty and you can imagine how its constant presence could serve as a torturous reminder to Earth’s impoverished inhabitants of the good life that is just out of reach. This time around the story is set in America but Blomkamp retains the international flavour which was such a point of difference in District 9. The rundown Los Angeles setting, actually shot in Mexico City, possesses a similar dustbowl aesthetic to the Johannesburg shantytowns of District 9, and stands in stark contrast to the lush greenness of life on Elysium. Both on Earth and Elysium we hear multiple languages spoken. Sharlto Coply, the star of District 9 who is back as the vicious agent Kruger, is even allowed to speak in his natural South African accent. Blomkamp had a hard act to follow after the success of District 9. Not only was that film so clever and brilliantly executed, it also had the advantage of being a complete surprise. Elysium, as one of the year’s most anticipated blockbusters, has no such luxury. Blomkamp’s offering doesn’t exceed expectations, but it does enough to satisfy them and is definitely the most original and interesting of the big-budget event movies we’ve seen this year.